If you can't resist the urge to play with the data, we have new charts at Pollster.com that can satisfy your need. These are interactive versions of the charts here and previously at Pollster. You can exclude pollsters or methods. You can change the sensitivity of the fit to either more sensitive or less sensitive than our standard fits here. Give it a try and let us know if you run into any problems. You can embed the results of your experiments on your own page, though not the interactive features. At the moment the embedded graphs are scaled at 450 pixels wide. To fit them here I edited the html code to make the width 400 and the height 308. I hope we can automate that soon, but meanwhile if your width is fixed and below 450, changing two lines in the embedded html will fix it for you. 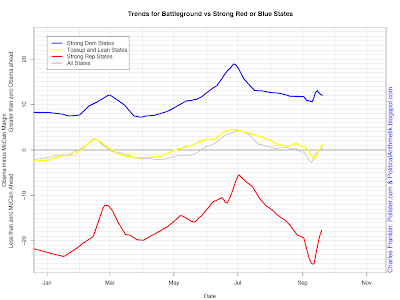 These charts are available for a growing number of states at Pollster.com. Stop by and play! "I think one of the things driving the national polls is that the red states are redder," said David Axelrod, one of Obama's closest advisers. "In the battleground states, the race has held pretty firm." An interesting claim. 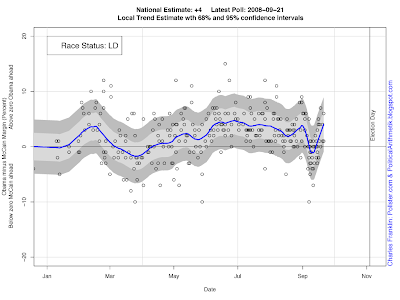 Let's take a look at the data based on state polls, rather than national. Among the strong Republican states, McCain has gained more than 8 points over Obama since shortly before the conventions, turning a 14 point lead into a 22.5 point margin, a huge gain. Among the strong Democratic states, the effect of the conventions is a tiny 2 point move in McCain's direction, from an Obama lead of 12 points before to 10 points now. But the rest of the states, rated lean or toss up, have also shown movement. These swing states had a 1.5 point Obama lead before the conventions, and that has now turned into a 3 point McCain lead, a 4.5 point shift. So Axelrod is right that the biggest gains for McCain have come in the reddest of states, and those may influence national polling. But the evidence doesn't back his second claim, that the battleground has held firm, unless of course you mean they are still battleground states. But now battlegrounds that on balance favor McCain rather than favor Obama as they did before the conventions. One caution: the lean and tossup states are themselves heterogeneous, so a single trend estimate such as the 4.5 McCain lead here is itself a simplification. If you wanted to focus on the six or eight states that probably hold the key to the electoral vote, you could slice this more finely. When we fit the data to just these eight tossup states, we see a 3.5 point move in McCain's direction, from a 2 point Obama lead to a 1.5 point McCain lead. Only a point less shift than among all lean and tossup states. No matter how you slice it, the battleground states have a lot of battle left in them, and campaign events are having effects across all states, though larger in some than others. The gains of the Republican ticket continue in both state and national polling as more post-convention state polls become available. We now have 26 states with a post-convention poll and the results mirror the sharply pro-Republican movement seen in national polling since Sen. McCain's acceptance speech. The McCain lead is now about 3 points in national polling and is just under 4 points for those states with post-convention polls. An important point is that the states with post-convention polls are not a representative sample of all states, though the differences between states without a recent poll and those with new polls is not large. States without new polling have averaged 2.1 percentage points more pro-Obama than those states with new polling. 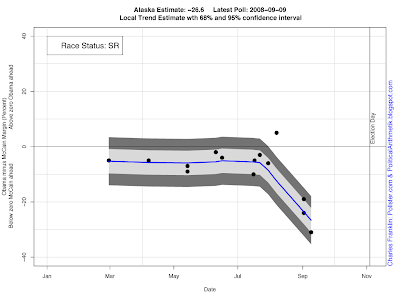 However, if we plot the trend lines in the chart for all states (with or without new polls) and for those with post-convention polls, we see the two trends have followed similar if not identical trajectories. Since our last update of this comparison of state and national trends the addition of new states has brought the state trend line a bit below the national polls trend, something not so visible in the earlier post. This difference reflects the selection of states that have new polling, rather than shifts in the vote margin in the states, except of course for the brand new polls. Right now that magnitude of swing is looking about right. The states with post-convention polls are: Alabama, Alaska, Colorado, Florida, Georgia, Idaho, Maine, Maryland, Michigan, Mississippi, Missouri, Montana, Nevada, New Hampshire, New Jersey, New Mexico, North Carolina,North Dakota, Ohio, Oklahoma, Pennsylvania, Virginia, Washington, West Virginia, Wisconsin, Wyoming. I did an hour on Minnesota Public Radio on September 10 discussing polling techniques and issues. Here is a link to the audio. Good callers! The focus on polling starts at 11:00 minutes into the show. The McCain campaign has gained significant support in national polling since the end of the Republican Convention, but what about the state polls? Has the shift also been reflected there? 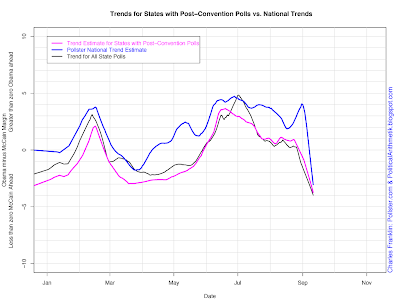 State pollsters appeared to go on vacation for the conventions, with very little new polls during the two weeks of conventions (and the week before). Now the pollsters are back, tanned and rested and ready to go. We've added 17 new state polls since the RNC ended, and while we'd love to see more, it is enough to get started with some analysis. 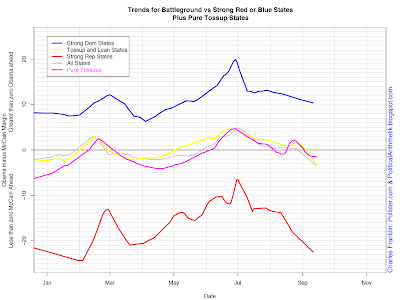 The chart above shows the national trend in blue and the trend based on those states with post-convention polls in purple. Over the course of the year, the two trends have followed each other rather well with some small differences in details but qualitatively similar patterns of up and down movement. Now in the post-RNC period, the states with new polls match the national polls quite closely, both giving estimates of about a one point McCain lead, with the states maybe a shade less than that. 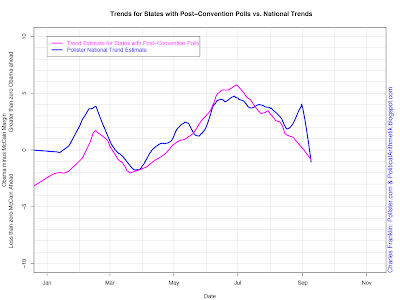 This post-convention bounce may or may not last, but at the moment the evidence is that it is moving across the states (and these are mostly competitive states) at about the same rate as it is for the national polls. The state polls show no positive DNC upward bounce, but that's because there were practically no new polls during that period, so don't jump to that conclusion. It is an artifact of no polls. States for which we have new polls are Colorado, Florida, Maryland, Michigan, Montana, New Jersey, North Carolina, Ohio, Oklahoma, Pennsylvania, Virginia, Washington and Wisconsin.